Then, on March 10, another MAX crashed. Ethiopian Airlines ET302 crashed under similar circumstances. China grounded the airplane within a day. BY March 13, the Federal Aviation Administration finally followed the lead of countries worldwide. Yet the stock remained well above the closing price after the Lion Air crash. Even after Friday’s after-market announcement that Boeing will cut MAX production by 10 airplanes a month, the stock yesterday closed at $374, well above the Lion Air low. ← How will MAX recertification affect future airplanes? I wonder why the market didn’t respond after the Lionair crash. Indonesia, too big to fail, Lionair trackrecord, compensation-no legal action contract with family victims. Please wait for final investigation report next year, avoid speculation, maybe pilot traing failed, political powerplay? Perception managent..
Is it really something to be proud of? Maybe Flight safety culture or ethics policy fell down the priorities list. The CEO comes from a colleteral damage tollerance environment where Defense is about neutralizing targets. Is Boeing still buying back their own stock? do they have to make the act public? Air Berlin buys more 789 3 days earlier. Afaics Boeing’s stock value is “managed”. .. by any means ailable. Keesje: What is meant by Indonesian too big to fail? This is Boeing stock not Lion or the Country of Indonesia,. It appear that the financial sector believes that the MAX issue is temporary and the losses arising will be of relatively small magnitude. Implicit in this assumption must be that the MAX will suffer no long-term reputational damage from the passengers or airlines perspective. As it stands the raw cost of the disaster is relatively small in relation to the profitability and FCF generated in the recent past, the most significant issue is the income stream being moved to the right by a number of months. So what would really affect the Share Price? 1 Anything that points to a systemic issue across the wider Boeing portfolio of aircraft eg Certification issues in the future or perversely the past. 4 A fundamental change in the supply-demand conditions for SA that mean airlines have a choice not to buy the MAX. Beyond that the MAX is effectively ‘protected income’ for a minimum of $20bn to $25bn stretching over the next 7-9 years. That is a lot of cash. To put it in perspective this grounding is incurring the same sort of pain to Boeing as a less than 1% efficiency loss in Renton and is not very significant at all. So it is easy to see why the Boeing senior management are willing to play with safety. With their focus on the bottom line this is a minor hiccup that will not damage their stock options providing they put a brave face on it and deny culpability at all times. Point of fact Boeing has admitted culpability, whether you believe them in their remorse or just that they got caught is beyond justified. The problem is its not viewed as playing with safety at the top. There is maximizing profits. Its at the lower level they understand the consequences and how things should be done. And then you hope no one gets killed (and in this case forlorn). They did a study once, they found out that it was the middle managers that got ulcers. They had people telling them the real problems below and upper managers ignoring what they said. Does anybody really expect knowledge from the financial market? The professionals didn’t even understand their own products: subprime mortgage crisis. Mr Market is not the smartest guy around. Lots of inertia, but then, when woken up, he can overreact, too. At the moment the expectation is that the grounding is short enough that it will not have any long-term impact on BA’s profitability. What may change this feeling of invincibility is certification: long delays for MAX, process changes, grandfathering changes etc. There are now many certification agencies (and other government agencies) involved so it’s impossible to predict what the outcome will be. But there is certainly significant downside risk for Boeing (and thus BA stock price). Markets only look at history. They are not concerned with or involved in deaths (Insurance companies are but those are merely statistical fodder for the market) . The market sees dual accidents in the past (707, 727, Comet, DC-10, 737 twice) and what occurred. Aircraft companies went on to recover just fine. Can it happen otherwise, sure. But Markets tend towards the long term odds not the short term hiccups. Sure enough, it went the other way. The average is nice, but the highs and lows are not. Part of his job is to contact his clients when it goes bad (1000 points drops) – I am peanuts by the way – and assure them this too will pass. People mean nothing to markets. Like them or not like them, consider them competent or incompetent as you will, but Wall Street/City/Bourse investment firms and large mutual funds have ranks of analysts constantly researching, collecting data upon, building qualitative and quantitative models of and running multiple scenarios of the future for major investments such as Boeing. They aren’t just running simple linear regressions based on the last 3 months’ closing stock price. “just fine” doesn’ seem to fit the Comet whose delay helped the 707. And the FAA kn0ws when to hold em and when to fold em. Are the Indonesian authorities invited? If they pay the airlines $500,000 per month for the lack of aircraft x 350 x 6 months is 1 billion, plus a billion to the families of the victims, plus a 1,000 dollar fine for infractions in the certification process. The total damage could be in the 2 to 5 billion range, so the stock price probably reflects that. Over the next fifteen years, I could see it dampen 737 sales, and hopefully speed up new aircraft development. We will see. If outside regulator refuse to return the 737 MAX to service then it could get very difficult for Boeing. I think we can safely say that if any regulator has a problem the FAA will address it. While the FAA has been cozy with Boeing, they just were given a poison pill and got severely ill. Bureaucracies when all is said and done move to protect themselves first. A few free lunches or buying a gulf outing is not worth the career. Boeing for the foreseeable future is on its own. Yes, long term they will chip away at the regs again. Sadly its the nature of the beast. Seems irrational. Reputational damage to Boeing is and will continue to be profound, the crashes have broken the world safety system (in the sense that the Europeans and Canadians, to name just two, now distrust the FAA) and moreover, Boeing, of all US companies, has about the most to lose from trade wars. Boeing sells aircraf to Dailiness and not individuals. Yes Airlines will leverage the issue for better deals, but they are both committed and stuck as an alternatives source for the numbers in the backlog do not exist. Airbus can’t ramp up and take advantage of the issues. Lead times are so far out that its all about monthly number build and horse trading those around. Everyone looses from trade wars, which is why they are so stupid to not focus on issues and just humpty Trumpy into them. A significant factor governing share prices these days is automated high speed trading. Given that machine traders literally cannot see the writing on the wall, perhaps Boeing’s share price stability is not surprising. If a real investor sells off some shares, that might suppress the share price a little. That’s going to grab the attention of the machine traders which will snap up those shares, hoping for a price rise back towards the average. And it does, and so the shares get sold again. Etc. And so the conditions are perfect for investors to quietly offload shares in dribbles. This is what might actually be happening. 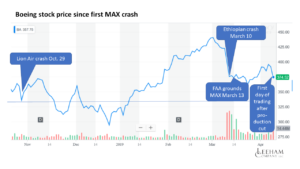 Once one system admin decides to override their machine, perhaps when some really big problem becomes public (eg 737MAX not retuning to flight globally) the price could crash very quickly indeed. The volume traded around Ethiopian is a multi year high and remains elevated but even these high levels are just 5 or 6% of shares oustanding. I’m sure the big insitutional shareholders (Vanguard etc.) who own 70%+ of the shares outstanding are being reassured energetically. So is there merit to the shareholder lawsuit?